Modhumoti Bank Job Circular 2018 to found my website. Modhumoti Bank is the newly best commercial bank in Bangladesh. Welcome to Modhumoti Bank Recruitment System. Modhumoti Bank has been published Job Circular. Modhumoti Bank recruiting process name is e-Recruitment System. Modhumoti Bank dedicates to find the most prospective talented professional individuals who are highly career oriented and enjoy working in a dynamic environment. Modhumoti Bank recruited some experienced persons are required for Head Office and other Branch. Recently the bank published Modhumoti Bank Limited Job Circular. 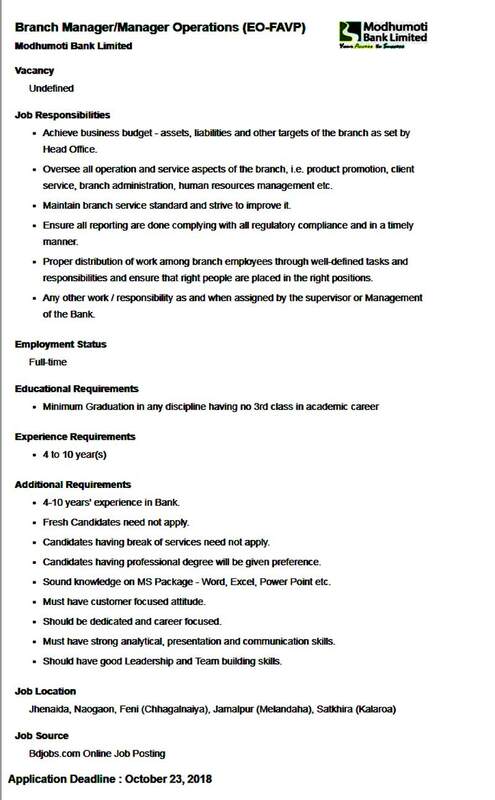 Modhumoti Bank Limited is seeking individuals that will live by bank values in all aspects. Modhumoti Bank Job Circular 2018. ■ Job Description: Modhumoti Bank Limited is an equal opportunity employer and welcomes applications from female candidates. Any persuasion will disqualify the candidature. This job position is a challenging career with superb prospects for ownership and success. ■ How to Apply: If interested, please send your application with a complete resume along with 2 (two) copies of recent passport size photographs, experience and salary certificates addressed to the Head of Human Resources Division, Modhumoti Bank Limited, Head Office, 4th Floor, DCCI Building, 65-66 Motijheel C/A, Dhaka mentioning the post applied for on the envelope. Only shortlisted candidates will be called for interview. Modhumoti Bank Limited only shortlisted candidates will be called for the interview as per recruitment process. Any kind of persuasion/ canvassing in any stage of the selection process shall be treated as disqualification. Modhumoti Bank Limited the right to accept or reject any application without any reason whatsoever. Modhumoti Bank Job Circular 2018.